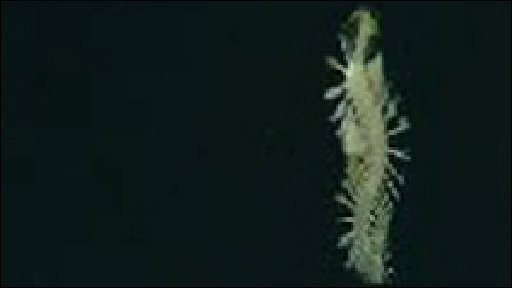 A group of glowing worms has been found dwelling in the deep ocean, some of which release body parts as tiny "bombs" to ward off predators. 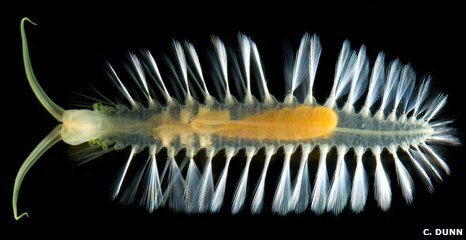 Researchers describe the bizarre "Swima worms" in Science journal. 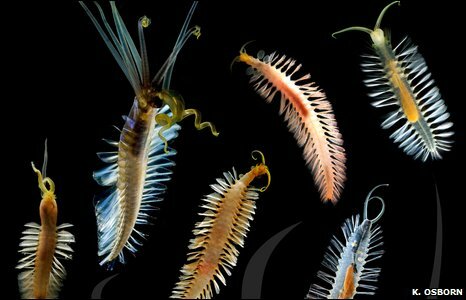 The creatures, which the scientists say could be widespread in the deep sea, indicate the extent of biodiversity yet to be discovered in the oceans. The team found them whilst exploring the waters just above the sea-bed off the west coast of the US. 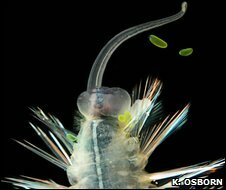 Lead author Karen Osborn, from the University of California San Diego, told BBC News that she and her colleagues found the worms accidentally, whilst exploring the deep oceans with remotely operated submersible vehicles. "We came across them and thought they were very interesting, firstly because of their bioluminescence," she said. "When we brought them up and realised they were different from anything that had been described before, we became even more interested." Dr Osborn and her colleagues were exploring depths of up to 3,700m when they spotted the creatures. As they continued to bring more of the worms back to their lab, they realised they had found a group of previously unknown animals. Each of the seven species found so far is transparent apart its gut, and all of the worms produce colourful bioluminescence. The researchers are now investigating what chemicals the animals produce to give rise to their striking glow. The animals are also excellent swimmers - using fans of long bristles that form swimming paddles. Five of the species release the glowing bombs, which probably serve to distract predators while the worm escapes. The team has named the first of these species Swima bombiviridis. "They usually have about eight of the bombs, and they drop one or two at a time," explained Dr Osborn. Because of the tiny size of the bombs - approximately 1-2mm in diameter - and the bright lights used by the submersible vehicles, the team was unable to capture this bombing on film in the deep ocean. "So we bring the animals up to study them," Dr Osborn said. "If you transfer the animal into a small tank, and harass it a little bit with forceps - kind of bump it anywhere on the body - it will release one of these bombs. "As soon as [the bomb] is released it starts glowing green and the animal swims away." Greg Rouse, another member of the research team, explained that a common ancestor of the species had gills that appeared to be "in exactly the same places as the bombs", from which the bombs could have evolved. "The gills (of their relatives) can fall off very easily so there's a similarity of being detachable, but for some reason the gills have transformed to become these glowing little detachable spheres." Dr Osborn concluded: "This group of really fantastic animals emphasises just how much we have to learn about deep sea organisms and deep sea biodiversity."